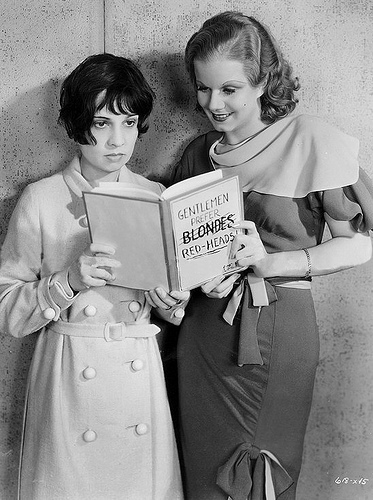 Anita Loos described in her 1977 book “Cast of Thousands: A Pictorial Memoir of the Most Glittering Stars in Hollywood” waiting on the set with Clark Gable and other stars in the film for Jean Harlow to get out of the hospital. Loos wrote the screenplay for “Saratoga” along with several other Jean Harlow films like “Red-Headed Woman.” The book is divided up into different sections about several different actors that Loos encountered during her time in Hollywood, and a large portion is dedicated to working with Jean, Jean’s marriage to Paul Bern and her death. 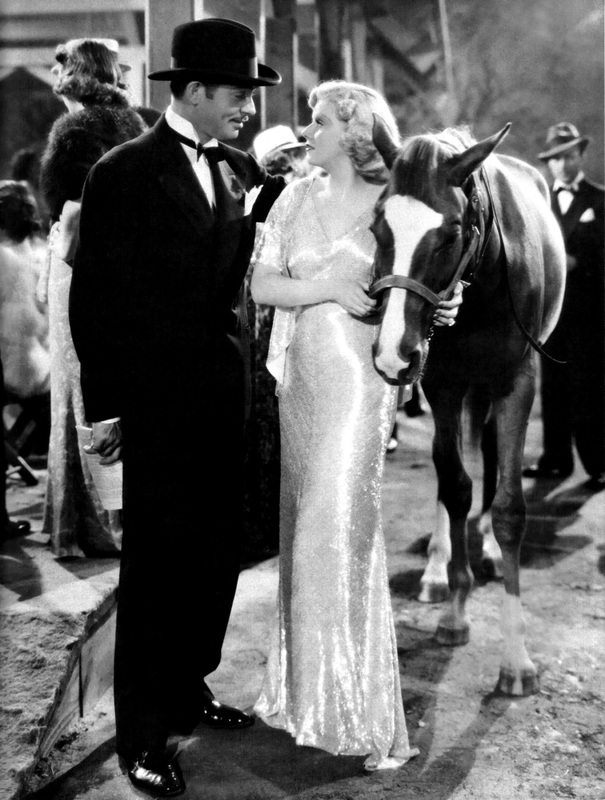 The stars were under the impression that Harlow would get well again, the film would be completed and they would continue on with their usual business. If I recall correctly, Loos said Harlow had been off the set for a few days and they continued shooting the scenes without her. When they received the phone call of her death they were shocked and close friend Clark Gable (who nicknamed her Sis) was devastated. I saw “Saratoga” two summers ago and thought it was entertaining but rather disturbing. The film was incomplete when Harlow died, so several of her scenes had to be shot with her double Mary Dees and a voice double. 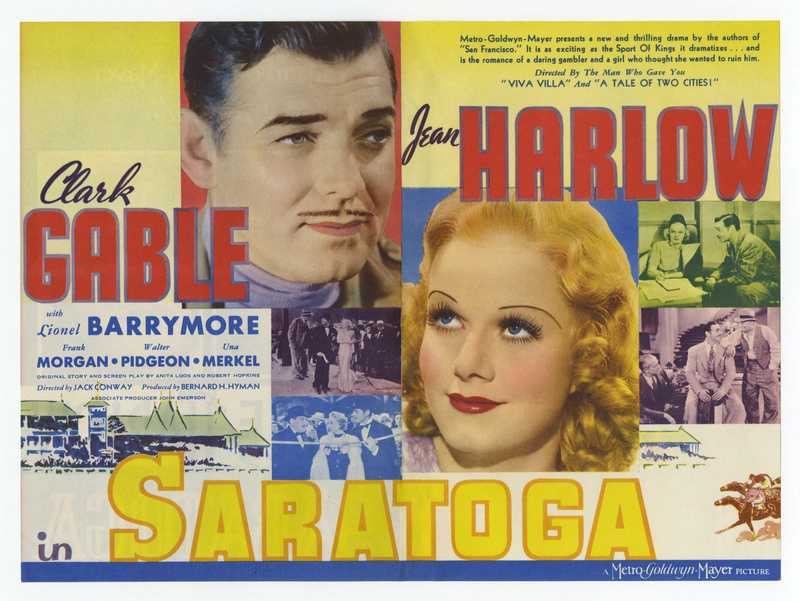 Regardless of the double, the general plot of “Saratoga” is good and it has a strong cast including Jean Harlow, Clark Gable, Walter Pidgeon, Frank Morgan and Lionel Barrymore. Clark Gable is his usual scoundrel, playing a gambler this time, who wins a ranch in a bet from Lionel Barrymore. Now that he’s won Barrymore’s ranch, Clark is now trying to win over his daughter Jean Harlow. This was Harlow and Clark’s sixth and last film together. With the star power here, this clearly wasn’t a B movie that they were throwing Jean in because they thought she was washed up. There was a lot of money at stake. After Jean’s death, there were talks about shelving the movie and reshooting her parts with Virginia Bruce or Jean Arthur. However, fans pleaded with MGM to let them get one last chance to see their Baby, according to IMDB. Gable and Harlow in their last film together. I have mixed feelings about reshooting with another actress or keeping Jean’s parts in the movie. Jean and Clark have terrific chemistry, like always. But frankly, the plot is predictable and typical of a Clark Gable movie. I personally think it was only saved by Jean Harlow’s comedic wit and beauty. Jean Arthur would have been terrible in the role and Virginia Bruce would have been just as predictable. The film would have fallen flat. But at the same time, I almost wish the film had been shelved, much like Marilyn Monroe’s unfinished movie “Something’s Got to Give” (Though the difference is “Saratoga” nearly done and Monroe’s movie just starting). I’m not saying that I’m not thankful to see one last glimpse of Jean alive and well, but it’s heartbreaking to watch. You see her at the beginning of the movie very beautiful and very much alive. It’s like watching someone on the street, knowing they are about to die, but they have no clue. After 74 years, Jean Harlow is still loved and missed and “Saratoga” is still a bit disturbing. We love you Jean; happy 100th birthday. This entry was posted in Star Profile and tagged Clark Gable, Harlow, Jean Harlow, Jean Harlow double, Jean Harlow's death, Jean Harlow's last film, Mary Dees, Saratoga by Jnpickens. Bookmark the permalink. I recorded this movie off TCM quite a while ago, but I don’t think I ever got around to actually watching it. I kinda feel sorry for Harlow’s double here because that must have been such a lousy job to have. It must have been pretty awful to have to put on Jean’s dress and go onto a set full of grieving people knowing darn well that no matter how well you did, you wouldn’t be fooling anyone. I agree. I’ve often wondered if people resented her for it. I wonder how awkward she felt, because it had to have been uncomfortable like you said. It’s not a bad movie at all, just a little sad and eerie to watch at the end. I read in a biography of Gabe (“Hollywood Misfit”) that he was apparently very short with the stand-in and wanted them to shut down the picture. It’s understandable I guess, considering how close the two were. I wonder if Hollywood can do what they did for The Crow-Brandon Lee. Remastered it and use computers to digitaly put Jean in…so it isn’t weird…I guess to costly but it would be cool. I love Jean Harlow but I can only watch “Saratoga” sparingly, for the reasons you list above. And even when I do watch it, I try my best to forget there’s a double there. But I am glad they completed the picture. It is a great one and she deserves to be recognized for her work in it.